The tap target <div id="slide-521-layer-19" class="tp-caption tp-…r tp-resizeme"> is close to 1 other tap targets final. The tap target <div id="slide-521-layer-13" class="tp-caption tp-resizeme">Design</div> is close to 1 other tap targets final. The tap target <div id="slide-533-layer-102" class="tp-caption tp-…rs-hover-ready"></div> is close to 1 other tap targets final. The tap target <div id="slide-218-layer-11" class="tp-caption t…ayer_in_column">FREELANCE</div> is close to 2 other tap targets final. The tap target <a id="slide-218-layer-3" href="https://ivanma…esto-con-qwilr" class="tp-caption t…rs-hover-ready">El presupuestoperfecto</a> is close to 1 other tap targets final. The tap target <div id="slide-218-layer-2" class="tp-caption t…ayer_in_column">DISEÑO</div> is close to 2 other tap targets final. 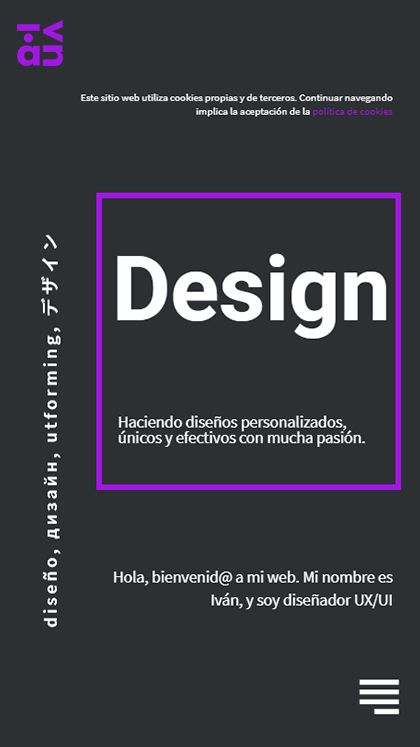 The tap target <a id="slide-218-layer-12" href="https://ivanma…s-de-diseno-ux" class="tp-caption t…rs-hover-ready">los 20 mitos del diseño UX</a> is close to 1 other tap targets final. The tap target <div id="slide-218-layer-9" class="tp-caption t…ayer_in_column">MARKETING</div> is close to 2 other tap targets. The tap target <a id="slide-218-layer-10" href="https://ivanma…euromarketing/" class="tp-caption t…rs-hover-ready">Mi punto de vi…Neuromarketing</a> is close to 1 other tap targets. The tap target <div id="slide-218-layer-15" class="tp-caption t…ayer_in_column">DISEÑO</div> is close to 2 other tap targets. The tap target <a id="slide-218-layer-16" href="https://ivanma…guia-diseno-ux" class="tp-caption t…rs-hover-ready">61 mejores con…s de diseño UX</a> is close to 1 other tap targets. The tap target <div id="slide-530-layer-57" class="tp-caption t…rs-hover-ready"></div> is close to 1 other tap targets. The tap target <p id="slide-530-layer-61" class="tp-caption tp-resizeme">El diseño de e…ts Iván Ibáñez</p> is close to 1 other tap targets. The tap target <div id="slide-520-layer-102" class="tp-caption tp-…rs-hover-ready"></div> is close to 2 other tap targets final. The tap target <div id="slide-520-layer-102" class="tp-caption tp-…rs-hover-ready"></div> is close to 3 other tap targets final. The tap target <div id="slide-159-layer-1" class="tp-caption r…_break_columns">Quién soyHola,…ro4. Aficiones</div> and 2 others are close to other tap targets final. The tap target <div id="slide-159-layer-4" class="tp-caption r…ayer_in_column">Quién soy</div> is close to 2 other tap targets final. The tap target <div id="slide-42-layer-57" class="tp-caption t…rs-hover-ready"></div> is close to 1 other tap targets. The tap target <p id="slide-42-layer-61" class="tp-caption tp-resizeme">El diseño de e…ts Iván Ibáñez</p> is close to 1 other tap targets. Report created on Jan 08, 2019, 13:03 PM GMT+0 in 12 min.